4 Reasons Why I Still Wake Up at 4:22 A.M. This originally appeared on my column at Inc.com on 10/27/2016. I love waking up when it’s still dark out. I feel the most productive when I can get several things done before most of the world is even awake. Eighteen months ago, I wrote a post about why I do that, called “Why I Wake Up at 4:22 A.M.,” and the response I received from readers all over the world was incredible. A lot has changed in my personal and professional life over the last year and a half–I’m traveling more for work, my job has changed in scope as our company has grown, and I have several new responsibilities. Through all of this change, one of my most important constants is that I still wake up at 4:22 each morning. Many people I encounter are a mixture of impressed and confused, or scared, by the fact I spring out of bed when most everyone else is still sleeping. But I actually find it pretty easy to get out of bed that early. That’s because I’ve discovered that determination and commitment to regimens are crucial–even during times of change. Since I published the piece referenced at the top of this article, Fuze has changed significantly. The company’s grown. My team has grown. I have more direct reports. The list goes on. Throughout all that, I’ve kept my center by staying healthy, starting my day off right, and dedicating even more of my time to planning to make sure everything is as smooth as it can be. Remember, having more or different responsibilities doesn’t mean you have to change what got you where you are. While a number of things have changed in my life since March 2015, there are a lot of things that haven’t. I still wake up at the same time–something I’ve been doing for more than a decade. I find that the early morning hours are incredibly productive. Although my day-to-day roles and duties have changed, I’ve kept my early-morning hours free to devote the peaceful time to free thought. I also use my mornings to catch up on industry news and find out what our competitors are up to. I still vacuum twice a week. There’s also time for nonwork stuff, too. I’m still doing CrossFit every day at 6 a.m. and have started running on Friday mornings in Brooklyn Bridge Park. I spend my days running the product management team at Fuze here in NYC. I also spend about half the month traveling, to our headquarters in Boston as well as our various customers and sales offices around the world. During normal work hours, I don’t have time to just sit down and write anymore. Rather than accepting that reality, I’ve chosen to be proactive in the early mornings. I use the time to write position papers, do competitive analysis, and try new products. I also do a considerable amount of planning, using Evernote to catch ideas that relate to product strategy. Once I make it to the office, I cue up what I’ve found and discuss it further with my team. One of the biggest changes I’ve had to adapt to is the fact that I travel a lot more. Despite long flights and changes in time zones–think landing in Europe at 10 p.m. local time–I still force myself to wake up early and exercise. You might think it’s a little obsessive to only book hotels that are within running distance to a CrossFit gym. I have found that no hack for fighting jetlag works better than taking a melatonin to get a deep sleep upon arriving, and then forcing myself to go to a 6 o’clock class the next morning. With a little bit of planning, you’re much more likely to work out and stick to your schedule. Your body remembers the pattern and starts to boot up much more quickly than if you’d given in to your jetlag and stayed in bed. The bottom line is that no matter what comes your way or what changes in your personal or professional life, you need to take care of yourself. You need to take time for yourself and your job that allows you to plan better and become a more effective leader. So many of us deal with changes by adjusting our whole routines. But, it turns out, sticking to some parts of your original regimen will help you adapt to the changes you face. There’s no sense in changing your entire life around just because you had a change in your life or job. Stick to what got you where you are, and chances are it’ll take you even further. I was recently at a startup event here in NYC and was having a great conversation with a random set of folks. We all started shaking hands in preparation of splitting up, ready to charge forward and continue networking with other people. I extend my hand to one of the woman to shake goodbye and instead she says, “Sorry, I can’t shake hands right now. I hurt mine this morning.” She turns her hand over and reveals a set of band-aids over the top part of her palm. I smile and ask “What was the workout?”, while quickly turning over my hands to show my chewed up palms and the scars of a few old but nasty tears. We both laughed and spent a few more minutes talking about Crossfit; what our boxes (home gyms) were like, the communities there, and which movements we hated the most (her = burpees, me = rowing). 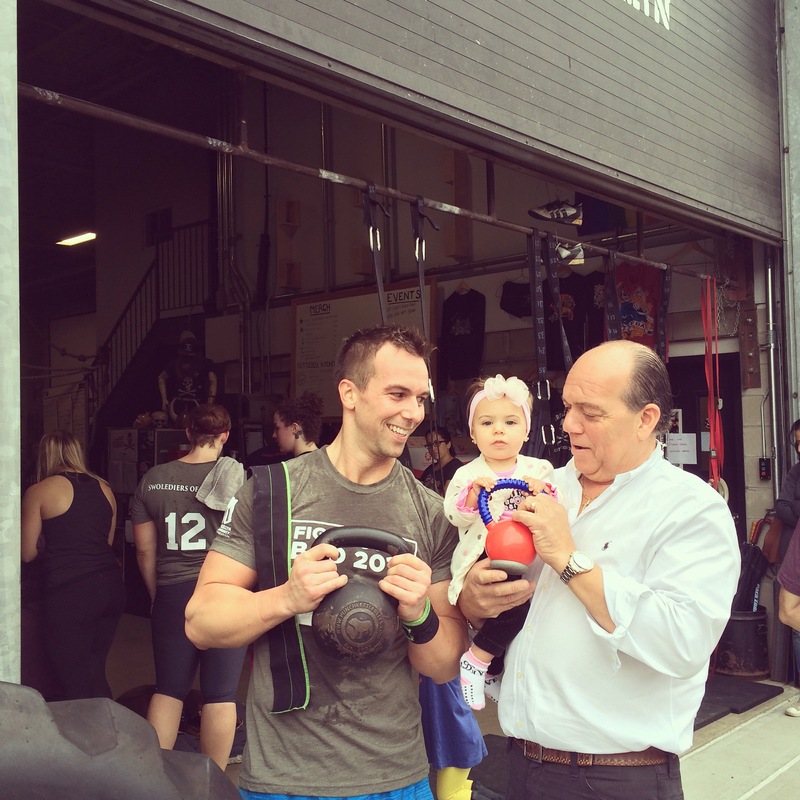 It’s not the first time I’ve met a fellow Crossfitter at a startup event, and it made me reflect on the similarities between Crossfit and the actual experience of being in a startup. Some context: I do love me some Crossfit. I can talk for hours about it because it’s something I’m passionate about and it makes me happy. I’ve been doing it for almost six years now, having worked out with Eric and Nadia at the awesome Crossfit Belltown in Seattle for many moons, then joining the very hip Crossfit South Brooklyn when we moved back to New York last year. I’ve always been an athlete through soccer, swimming, and generally being a gym rat for as long as I can remember. I love it so much I even became a personal trainer and group exercise instructor at Boston Sports Club while I was in college (I taught a pretty mean cardio kickboxing class). So what, then, does the Venn diagram of Crossfit and a startup look like from my perspective? Here we go. Crossfit is intentionally intense. It’s based on the premise of high-intensity work done over short periods of time (“intervals”), meant to maximize the benefit of the exercise. I go for one hour a day, five days a week, and always feel great because I know I was as effective as possible in getting my workout in. The same set of folks go to my 6am class almost every morning and many of them are now good friends of mine. We cheer each other on while pushing each other to work as hard as possible. The unique “Workout of the Day” is always different than the prior day and never lets you feel like you’re being repetitive. To me it feels exactly like working in a startup: every day at work is different than the last, I often work super hard for intense sprints of time, and I could never get anything done without the support of my team. 2. The right kind of competition. My friends Peter, Brad, and I are always racing against each other in our 6am workouts. We know each others’ strengths and weaknesses, so when we’re planning out how to approach a workout we share tips and then a few taunts to push each other. The coolest part? You’re never really competing with your friends (unless you’re doing a competition), you’re pushing and competing with yourself. Whoa, #meta. Your community at Crossfit, like your team at work, are your support systems for setting personal goals and working super friggin’ hard (see point 4) to achieve them. 3. It’s all in the data. We use an dizzying array of technology at Klink to monitor our products and users, making sure we know everything about their experience via the telemetry that gets reported to us. Combined with the fact that we are a big data company building customer intelligence solutions, and you would be correct in saying that my work is full of data. The goal is to always make measurable progress with our products and our customers. We similarly track everything at Crossfit: how long it took to do a workout or how many reps you got, how much weight you squatted or how many pull-ups you did. There’s an important belief in the Crossfit system that you can’t improve if you don’t keep track of how you’re doing, so I use an app called MyWOD to monitor my progress and refer back to it each week as I’m planning my strategy for the different workouts. I like to do things to the max. Crossfit workouts typically have a concept of a ‘prescribed weight’, meaning the maximum recommended weight to use. I almost always use that weight and almost always finish the workout in time (or with high reps, etc.). Yet every couple of workouts, like the 4x4x4 one from mid-January, I get completely crushed. For that one I had to lower the weight from the prescribed amount and still finished over 2min past the 10min time cap – it was one of the hardest workouts I’ve done in months. The thing that got me through it? My entire 6am class surrounded me as I pushed through the last set and cheered me when I finished (and promptly collapsed onto the floor). Super-hard challenges requiring a ton of personal effort and the support of a team to finish? See “Working at the office until 2am on a financial model due the next morning”, or the always fun “Dogfooding a hotfix all-day on a Sunday so you can fix an urgent customer bug”. Every week at work there’s always a day or two that feels like that 4x4x4 workout: it requires an all-out effort from everyone on the team, everyone works past the clock, and no one does it alone. Are you a Crossfitter? What’s your favorite workout?